A pergola can be a shaded covered pathway or outdoor room covered with greenery or an attachment to a building serving as a covering for a terrace. The romantic pergola has always been a sought after feature in gardens, both for its lovely appearance and as a shady shelter from the sun. Pergolas add comfort and character. A pergola with vines rambling and clustering overhead provides a shady shelter where the family can sit and talk when the day’s activities are done. The pergola consists of a series of cast stone, GFRC, fiberglass or GFRS columns, supporting a beamed framework and an open lattice. This simple and beautiful structure is often planted with vines, roses, wisteria or other climbing plants. The pergola shades out the summer sun but lets cooling breezes through. Pergolas can be used to create either outdoor rooms or covered pathways. Use as an open air room, a dining area or a secluded hideaway. Pergolas should be constructed of durable and long lasting materials. Many wood pergolas will not last 2 years. Fiberglass is a much better material for the beams. Columns should be stone, fiberglass,GFRS or GFRC. 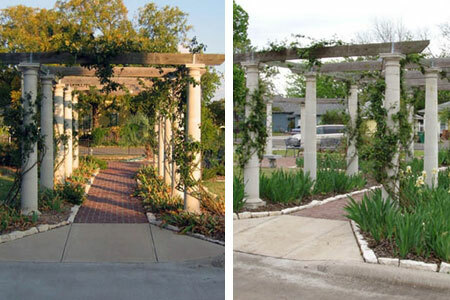 Pergola columns should generally be at least 8’ tall (10’ minimum is even better if they are to be planted with vines). As they grow, the plants will decrease the clear height and the clear width. If the pergola is to be planted with vines and climbers the plants will take up some room. Generally pergola columns should be set about 8’ apart. The term pergola comes from the Latin word pergula, meaning a projecting eave. In early renaissance gardens green arched tunnels were built from willow shoots bound together as “withes” and used as shaded passageways with climbing plants growing over them. Pergolas developed as a more permanent architectural feature. In Renaissance Italy, where the pergola developed, they were originally grape arbors rather than wooden posts. In the gardens of the great historic Italian villas near Rome and Florence, the pergola is an extremely important and ornate structure. These pergolas are constructed with massive supporting stone columns and wreathed in gorgeous climbing plants. In England, the Victorian landscape designer and garden writer Gertrude Jekyll and the architect Edwin Lutyens created several pergola structures and pergola covered walks at some of England’s finest estates. British pergolas of note include the Pergola at Hestercombe garden in Somerset and the Pergola and Hill garden at Hampstead. In America, Frederick Law Olmsted, designed the pergola at Central Park. The pergola became an important feature at the great homes of America. Trust the world's largest manufacturer of pergolas to expertly meet all of your needs. We have a 30-year track record of producing pergolas for owners of lavish hotels, resorts, and homes. You can rest assured that no job is too large or complicated for our dedicated team of designers, artisans, and production professionals.